Greatsearch.org is the PUP that uses misleading techniques to prevent removal. Use Reimage to locate malicious components and get rid of them faster than with uninstall instructions. A full system scan blocks virus reappearance and prevents traffic to malicious domains. Should I trust Greatsearch.org search? How to avoid Greatsearch.org hijack? How can I block Greatsearch.org redirects? Greatsearch.org virus does not offer such a great search function, believe us. 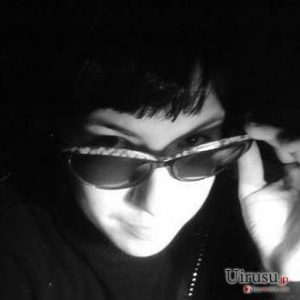 In fact, this potentially unwanted program (PUP) has been ranked as a browser hijacker, which means that it is that kind of program that changes your homepage with a suspicious search engine that serves paid results instead of organic ones. 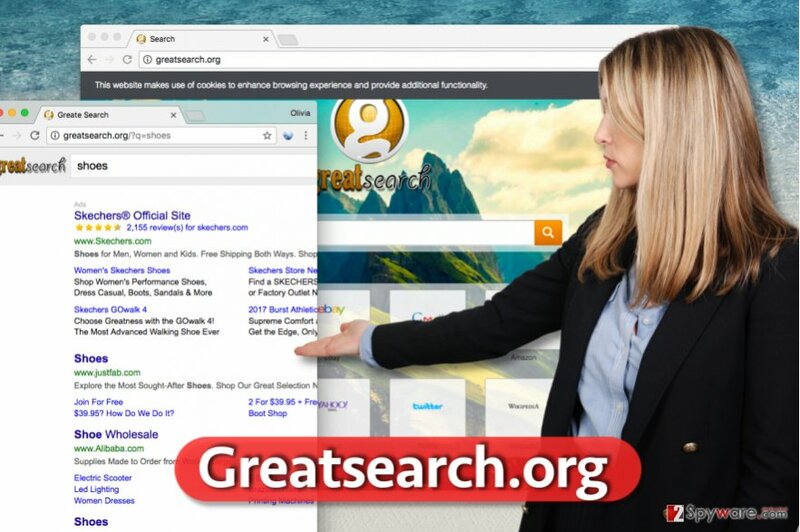 If GreatSearch Homepage hijacked Chrome, Mozilla Firefox, and other browsers, it means that you’re in trouble. However, usually the problem can be fixed by performing a single system scan using an up-to-date anti-spyware or anti-malware program like Reimage or Malwarebytes MalwarebytesCombo Cleaner. It can be a little hard to remove Greatsearch.org redirect virus manually, but if you use instructions given below the article, it shouldn’t be a big problem to you. Researcher shows sponsored ads incorporated in Greatsearch.org search results. First of all, after hijacking the computer system, this PUP employs tracking cookies to record websites that the user visits, browser type, IP address, search queries and similar information. Although such information is not considered to be personally-identifiable, we still recommend you to avoid such PUPs that collect it because pieces of information such as your search queries can contain some identity-revealing details. Finally, we must add that the company shares aggregated data with third-party advertisers and content companies. As a result, you will start receiving third-party offers in the form of search results or even pop-up ads shortly, but we highly suggest you stay clear of them because you can never know what websites are trying to lure you into visiting them. There’s a chance to come across dangerous websites, too. We heartily suggest you stay away from sites that ask you to enter personal information or download something from them. Such sites are likely to be untrustworthy, so do no fall for their trickeries used to swindle sensitive data from you or convince you to install more spyware or malware on the system. As we said, if you noticed that your browsers act suspiciously and cause unwanted redirects to the indicated website, a full system scan is required to complete Greatsearch.org removal professionally. Browser hijacking is a problem that many computer users are still unaware of. If you do not know how this technique works, you might get convinced to install programs you don’t want without noticing, too. To prevent PUPs from hijacking the computer silently, pay close attention to software setup settings every time you download something to your computer. Even legitimate software provides can try to trick you into installing bundled programs without allowing you to know, so stay alert at all times. Software developers make money by including additional programs in their installers and presenting them as “recommended” ones, but do not let yourself be fooled – they’re marked as recommended only because they’re paid to do so. We highly recommend you to remove all checkmarks granting your permission to install additional software. In some cases, it can only be done via Custom/Advanced installation mode. First of all, you will need to find shady programs and browser extensions associated with Great Search homepage. To begin with, look for shady programs in the Programs and Features Panel and uninstall them according to these instructions. Do not forget to fix browser shortcuts afterward! Here, look for Greatsearch.org or any other recently installed suspicious programs. Wait until you see Applications folder and look for Greatsearch.org or any other suspicious programs on it. Now right click on every of such entries and select Move to Trash. When in the new window, check Delete personal settings and select Reset again to complete Greatsearch.org removal. Once these steps are finished, Greatsearch.org should be removed from your Microsoft Edge browser. Here, select Greatsearch.org and other questionable plugins. Click Remove to delete these entries. Now you will see Reset Firefox to its default state message with Reset Firefox button. Click this button for several times and complete Greatsearch.org removal. If Chrome browser repeatedly opens greatsearch.org without your request to do so, it means that Chrome browser has been hijacked. To fix the issue manually, find and remove all vague extensions from Chrome browser. One of them might be called GreatSearch or similarly. Here, select Greatsearch.org and other malicious plugins and select trash icon to delete these entries. Click Reset to confirm this action and complete Greatsearch.org removal. Here, select Extensions and look for Greatsearch.org or other suspicious entries. Click on the Uninstall button to get rid each of them. Here, look at the Homepage field. If it was altered by Greatsearch.org, remove unwanted link and enter the one that you want to use for your searches. Remember to include the "http://" before typing in the address of the page. Now you will see a detailed dialog window filled with reset options. All of those options are usually checked, but you can specify which of them you want to reset. Click the Reset button to complete Greatsearch.org removal process. ^ The Difference Between Organic and Paid Search Engine Results. dummies. Web Design For Dummies Cheat Sheet. ^ Michael Sweeney. What Is PII, non-PII, and Personal Data?. 7Suite Blog. Learn about the world of Data Management. This entry was posted on 2017-03-30 at 02:04 and is filed under Stealing programs, Viruses. You can quickly scan the QR code with your mobile device and have Greatsearch.org virus manual removal instructions right in your pocket. How did you remove Greatsearch.org virus?